Open the gates of the world’s most famous palaces, from the sun-splashed courtyards of the Alhambra to the dazzling rooms of Versailles. There are over 90 flaps for children to lift, revealing the great halls of the Forbidden City in Imperial China, the tiled pavilions of the Topkapi Palace in Istanbul and the beautiful bedrooms of Hampton Court. 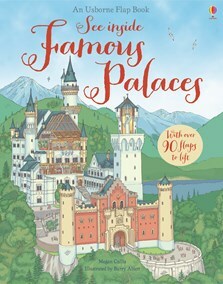 Eight of the most magnificent palaces from around the world, throughout time, all illustrated in immaculate detail for children to explore. With internet links to websites with virtual tours and more information via the Usborne Quicklinks website.